Tesla’s sky-high valuation represents a massive vote of confidence in Elon Musk’s sustainable energy vision. However, the potential of Tesla’s products to address our most important global sustainability challenges is low. This article presents some numbers to illustrate this point covering electric cars, autonomous vehicles, solar roofs and distributed battery storage. Elon Musk has already achieved more than most of us can ever dream of achieving in a single lifetime. His great success stems from an almost inhuman ability to tolerate risk while raising tremendous amounts of capital to pursue his visions. A good summary of the stress and strain Mr. Musk had to endure to get to where he is today is available in this interesting Bloomberg article. Needless to say, I have tremendous respect for Mr. Musk as a businessman. He has leveraged green ideas that people have been talking about for decades and built a company that now has a similar market cap as automotive giants Ford and GM. Given that Tesla sells about 1 car for every 100 sold by Ford or GM and has never turned an annual profit, this valuation is based solely on belief in Tesla’s green energy vision. There is just one fundamental problem: electric cars and residential solar are two of the highest hanging sustainable development fruits at our disposal. Sustainable development is all about achieving decent living standards for all without causing catastrophic climate change. When you read Tesla’s famous master plan, they seem to be well positioned in this regard – but this impression fades when you start to crunch the numbers. This article will present some of the most important crunched numbers on four key Tesla initiatives: electric cars, autonomous vehicles, solar roofs and battery storage. Few people understand just how small the medium-term climate change mitigation potential of battery electric cars is. Even though Tesla plans to expand to other segments, battery-powered electric drive remains fundamentally best suited to light-duty vehicles that are mostly used for shorter travels. Light duty vehicles consume about 40% of global transportation energy (below). 19 mb/d of oil consumption results in CO2 emissions of about 2.2 Gt/year – 6.8% of the global total. 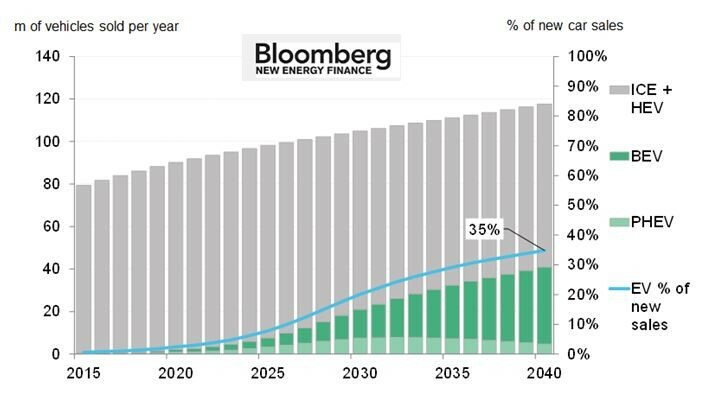 Electric car forecasts are all over the place, but the seemingly reasonable forecast from BNEF (below) gives about 20% electric cars on the road by 2040. 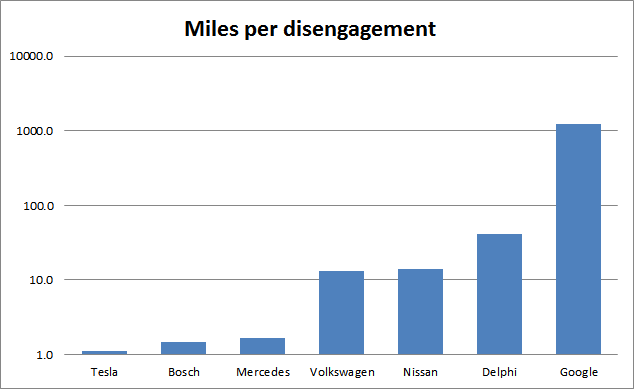 By that point, new conventional cars and hybrids should be averaging more than 50 MPG, aided by the fact that electric cars will take over predominantly city mileage where internal combustion engine efficiency is quite poor. Average electricity carbon intensity might have fallen to about 350 kg/MWh by that time. When assuming 50 MPG for conventional cars and 300 Wh/mile (including charging losses) for electric cars, it can be calculated that 20% electric cars in the fleet will avoid 8.2% of PLDV CO2 emissions in 2040 (ignoring the higher embodied carbon in BEVs and the potential of biofuels and synfuels to reduce gasoline carbon intensity). 8.2% of 6.8% amounts to only 0.56% of total energy-related CO2 emissions. The BNEF forecast suggests that electric cars will sell well without subsidies in about 5 years’ time. Based on subsidized sales statistics from the US and Norway reviewed in a recent article, however, this seems unlikely. For example, affordable BEVs command only 0.25% market share in the US, even though subsidies cover the entire battery pack cost. It is also worth pointing out that, under the assumptions outlined earlier, a BEV will avoid 14.6 tons of CO2 over a 200000 mile lifetime. The CO2 avoidance cost therefore exceeds $100/ton for a subsidy of only $1460 (current US subsidies are about 10x this number). The phase-out of the US federal tax credit for Tesla and GM towards the end of next year will be very informative. We can only hope that this does not result in the inefficient boom-bust cycles associated with the phase out of many other clean energy subsidy programs. As a climate change mitigation measure, such a scenario is very costly, especially when the reward is just over half a percentage point of the CO2 reductions required by the IEA 450 ppm scenario relative to the current policies scenario (below). Finally, we need to consider that BEVs shift the cost structure of cars more towards up-front costs. This is a problem in developing countries where low up-front costs are critical to enable the increased mobility required for continued exponential economic development. As quantified in this article, decarbonizing a developing economy with capital-intensive technology results in very large opportunity costs. It is also important to consider that the average developing world car is about half the price of the average developed world car (e.g. the most popular car in China starts at $7000). A sufficiently large battery pack will therefore cause a large relative increase in up-front developing world car prices. Given that the developing world will be a much more important player than the developed world in the great 21st century sustainability challenge, this is a very important point to consider. Earlier articles have estimated the potential economic benefits of autonomous driving technology to be more than one order of magnitude greater than the benefits of electric cars. It therefore appears to be an area worthy of investment from a purely economic perspective. As discussed in the aforementioned article, however, the bulk of the economic benefits from autonomous driving technology only become accessible when full autonomy (no steering wheel) is fully achieved (no more human drivers). And the list of technical and political challenges between now and full achievement of full autonomy is long and daunting. For example, this article estimates that Tesla is currently about 5 orders of magnitude away from full autonomy when measured by the frequency at which human intervention is required. Other companies like Google are much more advanced (below) and are therefore “only” about two orders of magnitude away. When it comes to sustainability, the benefits are more questionable. If my assessment of the potential of autonomous driving technology to enhance the attractiveness of carless personal mobility options like telecommuting and small electric vehicles is correct, this technology can potentially claim significant emission reductions. If I’m wrong about this, however, full autonomy could increase transport energy use and emissions due to increased (often wasteful) demand and empty miles. In any case, I doubt that global deployment of full autonomy will happen within the timeframes required by the 450 ppm climate change scenario. Another way in which full autonomy could make a substantial positive medium-term contribution is by increasing the capacity factor of cars in developing nations. Higher degrees of utilization will mean that less capacity growth is needed in a rapidly growing country, thus having a positive influence on growth. However, a large-scale deployment of full autonomy in the oft-chaotic urban environments of developing nations within the required timeframes appears highly unlikely. My view is that small electric vehicles offer a much more practical alternative to this great challenge (1, 2). The seemingly default link between autonomous driving technology and electric cars is also questionable. In fact, full autonomy will decrease the attractiveness of electric drive relative to the internal combustion engine because traffic flow should be much smoother and acceleration will be gentle. This will invalidate two of the biggest electric car advantages: high efficiency in stop-and-go traffic and a smaller cost increase and efficiency penalty related to increased power. This was discussed in more detail in an earlier article. 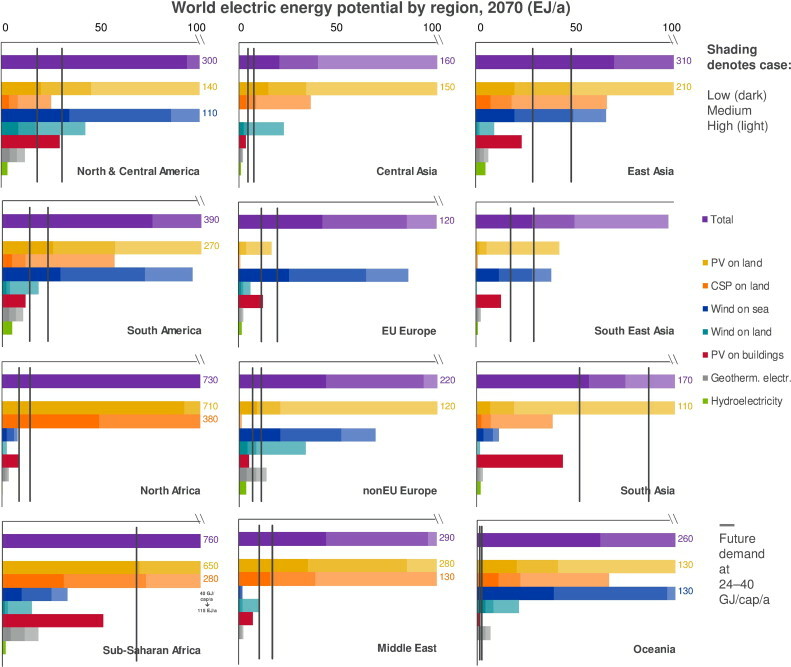 In a long-term future scenario where Gen IV nuclear power has failed to deliver, rooftop solar can become an important player in densely populated sunny countries such as India (see the red bars below as discussed in a previous article). However, this will be more due to a lack of other options than because of the attractiveness of this technology. The fundamental problems with small rooftop PV relative to utility scale PV will always be higher installation costs and lower capacity factors, substantially increasing the levelized cost of generated electricity. 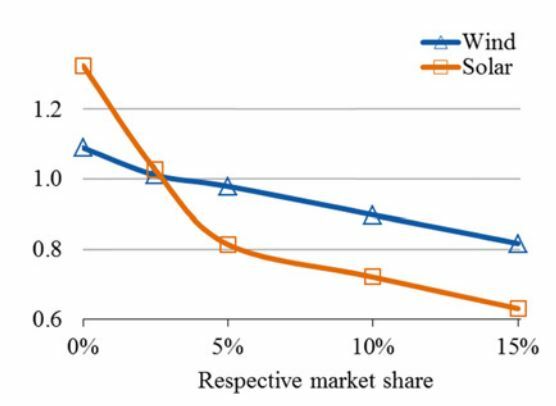 Yes, rooftop PV can potentially avoid grid capacity in regions where electricity demand always peaks when the sun shines at its brightest, but this advantage fades quickly with increasing market share and does not apply to grids that are already built. These effects have been reviewed more thoroughly earlier. The solar roof (illustrated below) will further accentuate these problems. I can see no clear reason why a solar roof will cost less than a normal roof with solar panels installed (and plenty of reasons why it will cost more). Also, the capacity factor of a solar roof will definitely be less than a roof with solar panels. For these simple reasons, many companies have tried and failed with solar roof tiles simply because they are not cost competitive with solar panels. In addition, solar roofs only make economic sense on new roofs, greatly restricting the potential market size. Yes, the solar roof will look a lot cooler than a roof with solar panels. And yes, Tesla’s brand could potentially sell cool roofs (although a cool roof will be a much harder sell than a cool car). But the fundamental potential of solar roofs to solve our 21st century sustainability challenge is very small. 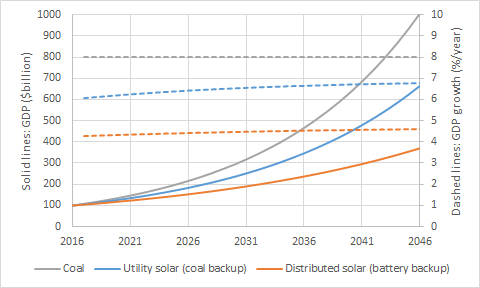 In the IEA’s 450 ppm climate change mitigation scenario, distributed solar grows to about 4% of total electricity generation by 2040. Given that solar roofs will only be applicable to new roofs and will probably be more expensive than solar panels, the potential of this technology should be at least an order of magnitude smaller, i.e. about 0.4% of electricity or less than 0.2% of energy related CO2 emissions. The low fundamental potential of solar roofs is further compounded by the fact that they will generate electricity at the same time as utility scale PV. Continued buildout of utility scale PV will therefore strongly reduce the value of electricity from solar roofs. Utility scale PV will be able to handle the decline in value shown above better than solar roofs simply because it is more cost-effective. The top two graphs illustrate high-volume energy storage applications and it is clear that battery technology will not be competitive for a long time. Some possibilities may open up for moderate-volume load following applications if open cycle gas turbine power costs double, but batteries remain uncompetitive with other storage options like pumped hydro and compressed air. Similar conclusions were drawn from my own energy storage cost analysis here. 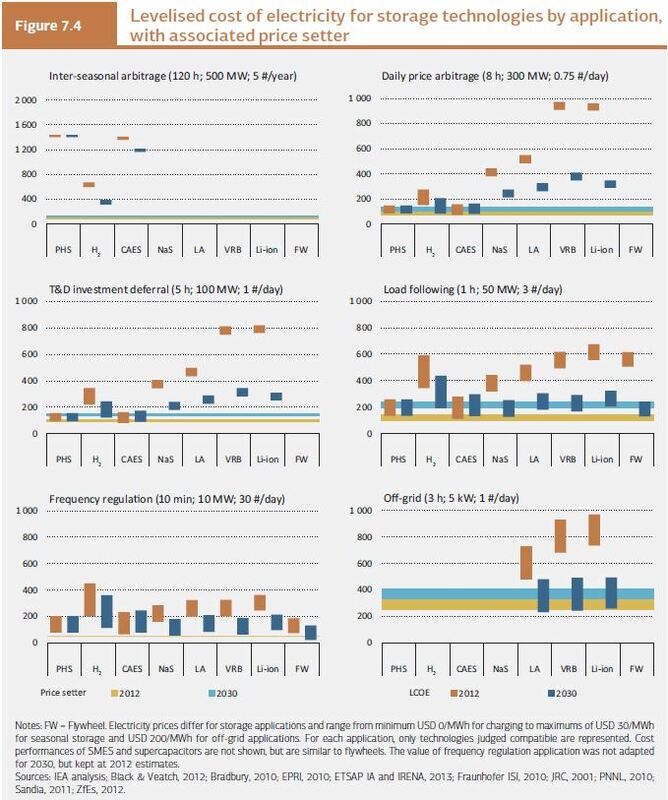 The potential of battery storage to significantly enhance the impact of distributed solar therefore appears to be small. Tesla’s Powerwall will sell many units in isolated regions with very high residential electricity prices, but the total potential for global CO2 avoidance by enabling cost-effective deployment of more intermittent renewables is probably in the same order as the solar roof. As a final illustration, I mentioned earlier that a large-scale rollout of rooftop solar PV may be necessary in a renewables-powered India. In a hypothetical scenario where India builds out its electricity system exclusively with $2000/kW rooftop solar+battery systems achieving a 15% capacity factor (including battery losses), fully half of India’s economic surplus would go to solar and batteries instead of economic development (e.g. decent housing, roads, commercial outlets, factories, hospitals and schools). The resulting effect on GDP growth is shown below as described earlier, leading to truly enormous opportunity costs of over $500000 per person over a 30 year period. Over the first half of this century, we will have to facilitate a quadrupling of the global middle class while actually reducing CO2 emissions. To have any chance at meeting this tremendous challenge, we have to be very pragmatic in terms of our investments, focusing only on the lowest-hanging fruits. It is easy to see Tesla’s electric cars and distributed solar+batteries playing an important role in the fully industrialized post-carbon world we will hopefully achieve in the second half of this century. In the crucial quest to safely reach that point, however, Tesla’s products represent some of the highest hanging sustainable development fruits in terms of total cost, cost structure and potential CO2 abatement. Despite them being excellent and very cool products, they will not save our planet and it would be prudent to phase out technology-forcing policies that assume they will. Full autonomy is the possible exception, although it is highly uncertain whether this technology will be ready to make a sizable impact within the required timeframes. The good thing is that autonomous driving technology will develop without any technology-forcing, thus avoiding the large opportunity costs associated with such policies.